In my opinion, duck is kind of the bacon of the poultry world – fatty and decadent and a little bit goes a long way. 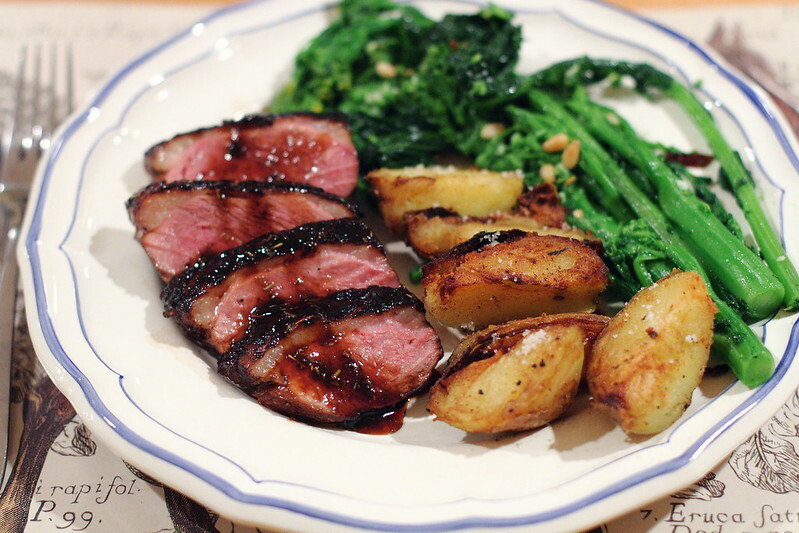 B and I were easily satisfied sharing one duck breast for this recipe, so feel free to cut it in half if you’re cooking for two. Oh, and frying potatoes in the leftover duck fat is almost the best part (besides the duck itself, of course). Cut small slits in the skin side of the duck breast, without slicing all the way into the flesh. 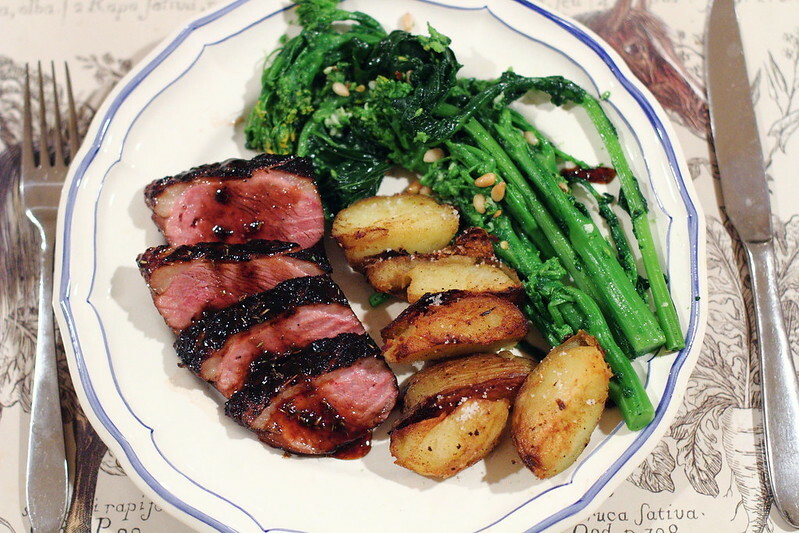 Brush the duck on both sides with balsamic vinegar and season with salt and pepper. Cover and let come up to room temperature (about 30 minutes). Preheat a large skillet over medium-high heat and sear the duck breasts, skin side down, for 7 minutes, reducing the heat to medium-low after 3 minutes. Flip the duck breasts over and cook them for an additional 4 to 5 minutes or until medium-rare. Transfer them to a plate and cover it with foil to retain warmth. Pour the rendered duck fat into a clean container and save it for the potatoes. Turn the heat up to medium and deglaze the skillet with the honey, balsamic vinegar, and Provencal herbs, scraping up the browned bits as the sauce cooks. Simmer the honey herb glaze for 2 to 3 minutes, until it turns slightly thick. Season it with a small dash of salt. Return the duck breasts to the pan, turning them a few times to coat them evenly with the honey glaze. Carve them and serve them immediately, garnished with a drizzle of extra glaze. Place potatoes in a pot of salted water and bring to a boil. Boil until fork tender. Strain and allow potatoes to cool for a few minutes before quartering or cutting in half, depending on size. Heat duck fat over medium-high heat until sizzling, then add potatoes and cook until golden brown and crispy, turning to brown on all sides. Sprinkle with fleur de sel and serve with sliced duck and sauteed greens (I cooked broccoli rabe using this recipe). The recipe looks fantastic and sounds pretty easy.